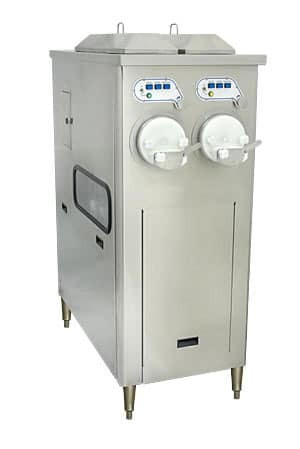 Manufacture and Sell Frozen Custard Machines. Provide Consulting on How to Open a Successful Ice Cream Store, Along With Training and Support. WHAT IS THERE ABOUT LANCASTER MANUFACTURING? What if we took a good machine and made it great? What if great frozen custard got even better? What if we still backed up those machines with excellent customer service? Using his training in manufacturing and contacts in the frozen custard industry, Tony started We All Scream Consulting and built the machines of his dreams. He took good products and redesigned them into great frozen custard machines. Pictured here is a floor model, 2 barrel frozen custard machine. Join the frozen custard revolution. Rebel against ice cream with a premium ice cream known as frozen custard! Our frozen custard machines make the thickest, smoothest frozen dessert you’ll ever put in your mouth. As a result, it’s so luxurious you may never eat ordinary ice cream again and it’s so indulgent your taste buds will thank you. Tony Carey and his staff at We All Scream work hard to help make other entrepreneurs’ dreams come true. They provide companies with a machine that makes the best frozen custard imaginable along with the training and support needed to get a business up and running. WHAT’S THE STORY BEHIND THE RED ROSE? You may be asking yourself ‘What’s up with the red rose in the logo’? Shouldn’t they have an ice cream cone instead of a red rose?’ As for the red rose, there are two things that factor into it. First of all, a red rose signifies passion. Lancaster Manufacturing is very passionate about frozen custard. Secondly, the red rose is the symbol for the House of Lancaster in English heritage. The original War of the Roses was between the House of Lancaster and the House of York. Essentially, it was the red rose vs the white rose. Approximately, this war lasted from 1455 to 1487. Our founder has ties with Lancaster, England. Hence, his attachment to the red rose. Do you know what it takes to open an ice cream store? Our We All Scream consulting services will guide you from start to finish. Take advantage of our free guide. We offer high-quality frozen custard machines that are manufactured in our own location. You have your choice of new, used and customized. Tony Carey has been in the frozen custard business since 2001. He grew up in England and has a bachelor degree in chemistry. He loves helping entrepreneurs. Share This Information on Your Network - Choose Your Platform!